--- Please Select --- 9'6" x 23" x 3"
For the ultimate ride, look no further than the Soulr squash tail longboard. 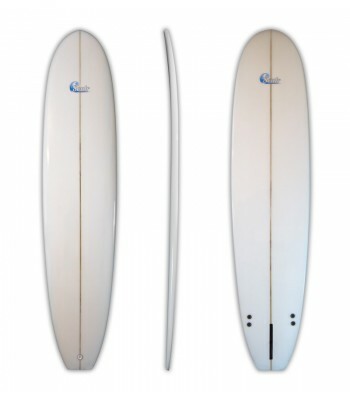 Hand shaped to perfection, this board boasts a long, wide profile with plenty of float and plaining ability. The bottom concaves have been finely tuned so you can stand up early and start maneuvering the board on the face of the wave. At the rear, you'll notice it tapers nicely into a 7.5" wide squash tail, giving the board plenty of speed and drive down the line. Once your up, you can enjoy the simple, retro look of the Soulr longboard as you cruise in the curl. Glide through the water with just one single fin, or install the two side fins for some extra bite. We recommend this board for anyone who loves a longboard, or those looking to learn how to surf. If you think this board might be too big, check out the Soulr Mini Longboard. It's got all the great features of this board, packed into a smaller package. Length 9'6" x 23" x 3"